So the latest version of the Oculus Rift was just released, and I've got one. It's called the DK2, and it's the next big step on the road to VR headsets becoming something people actually have in their living rooms. There's no set date for the retail version yet, but Mark Zuckerberg's controversial $2 billion cash-injection should hopefully help speed the process up. The big thing with the DK2 is the positional tracking. The old one only registered rotational movement, but now – thanks to a camera you clip to your monitor – it registers all movements. This means you can lean forward, or stand up, or move your head towards something, and it'll happen in-game. It also boasts an HD screen capable of 1080p and lower latency, which makes moving your head about feel much smoother. It's not perfect, and still has a long way to go before it's ready for general release, but it's an enticing glimpse into a future where sitting on a couch with a plastic box strapped to your head is completely normal. I've tried pretty much every game and demo with Rift support to date, on both the first dev kit and the new DK2, and these, for my virtual money, are the best. When you play Elite: Dangerous with a stick and thruster, your pilot's hand movements mirror your own exactly. In virtual reality, this is a bizarre sensation. After jiggling the stick around and watching my virtual arm do the same, my brain was fooled, briefly, into thinking it was my arm. Like so many Oculus Rift experiences, it's difficult to express in words just how weird this feels. Elite: Dangerous has native DK2 support, and makes impressive use of the new positional tracking. Lean forward and you can study the blinking panels and computers in your cockpit. Stand up and you'll get out of your seat and can actually walk around; providing you stay within range of the sensor. The sensation of being in a physical space is palpable. I've played every game to date that supports the Rift, and this is the most convincing. In dogfights you feel like you're piloting an X-Wing in Star Wars. Seeing enemy ships scream past your cockpit, and tracking them by moving your head, is thrilling. Frontier's Elite reboot is a great space sim on a regular monitor, but playing in VR with a flight stick, it's on a whole other level. VR developer Nick Pittom has recreated part of the otherworldly bath house from Studio Ghibli's magnificent animated film Spirited Away. His demo lets you explore Kamaji's boiler room, complete with tiny soot sprites dashing back and forth with lumps of coal to keep the fire stoked. It's a surreal feeling to step inside an environment you're so used to seeing on a 2D screen. Standing in the middle of the room and looking down to see the soot sprites swarming around your feet really sells it, and Pittom has captured the look, sound, and feel of Miyazaki's film perfectly. Exploring famous locations from film and TV is one of the most exciting uses of the Rift. Other places I've explored virtually include the bridge of the Enterprise from Star Trek, The Wall from Game of Thrones, and even Jerry Seinfeld's apartment from his hit '90s sitcom. The Oculus Rift can whisk you away to fantastic, hitherto unimaginable worlds, sure, but it's testament to the power of the tech that a truck simulator can be a mindblowing experience. Euro Truck Simulator 2 is a genuinely, unironically brilliant game. I installed it as a joke and ended up playing it for 30 hours and counting. 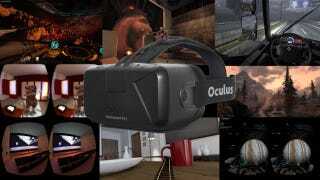 I has native support for the Oculus Rift, including the DK2. The moment it clicked was when I was driving from Aberdeen to Stuttgart and, hypnotised by how real it all felt, tried to lean my arm on the window. I briefly considered placing a cardboard box there in real life to rest it on, but decided that was a step too far. Playing with a force feedback wheel adds to the realism, as it simulates the rumble of the tarmac as you drive along. The sweet spot for VR seems to be games where you're stuck in one place; a cockpit, or in this case, a truck cabin. It helps that the interiors of the game's fleet of licensed heavy goods vehicles are so insanely detailed. You might think driving down a straight, featureless French motorway is a gross misuse of the technology, but this is one of the most immersive Rift games yet. Sometimes it's difficult to get your head around the sheer scale of space. Solar System Explorer helps by visualising the immense size of our solar system in a tangible way, allowing you to cruise around our cosmic neighbourhood in a physics-defying starship. It's all done to scale, and as you fly between the planets, you get a real sense of the great distances between them. This would be a powerful thing to have in schools. Let a kid fly from Earth to Jupiter and it'll fire their imaginations more than just telling them how far away it is. You can hover on the rings of Saturn, land on the Moon, descend to the surface of Mars, orbit the Sun, and visit the ISS. The fidelity of the planets and other galactic scenery isn't perfect, but for something made by a single person, it's a remarkable achievement. There's no DK2 version of this yet, but even on the low-res first development kit it's an amazing demo. You can import any video file – an HD rip of a film works best – and then watch it in a virtual movie theatre. No people talking, no kids throwing popcorn about. Bliss. You can bring up a floating holographic interface and switch seats in an instant. Sit at the front and you have to crane your neck to see the screen, which really gets across how big it is. One of the coolest, yet most subtle effects, in the demo is howthe theatre lights up dynamically, reflecting what's happening on the screen. If there's an explosion, for example, an orange glow is cast over the empty seats around you. If you live in a tiny flat, and don't have room for a big TV, this is an ideal solution. It's your own personal 500-inch television, and you don't have to pay £12 to sit in an uncomfortable seat surrounded by people noisily eating crisps. The problem, as with a lot of Rift games, is comfort. The headset, at least on the two dev kits released so far, is not a comfortable thing to have strapped to your head for long periods of time. The foam surrounding the eyepiece can get hot and stuffy. I made it about 40 minutes through Blade Runner in VR Cinema before I had to claw it off. Hopefully the retail version of the Rift, whenever that comes out, will be more pleasant to have hanging off your face. The new version of Epic's Unreal Engine comes with tools designed to make VR development easier, and a few demos have already emerged. This one, which takes you on a rollercoaster ride through a massive, realistic-looking living room, is a great showcase for the DK2's positional tracking. When you reach the top of the coaster, you can look over the edge and feel your stomach lurch as you realise just how high up you are. There's a moment when the rollercoaster takes you through the handle of a mug, with only an inch of space above you, and I felt myself instinctively duck when I went through it. Unreal Engine 4 boasts some beautifully natural lighting, which is a big part of making a VR experience feel real. There are a lot of rollercoaster demos for the Rift, but this is the best I've tried so far, and they're an accessible way to give non-gamers a taste of the technology. This might not be the most lavish demo in terms of production values, but it's still surprisingly effective. It sees you sitting in a chair in an office, and you have to keep two fingers on your keyboard's control keys. Let go and it's game over. As you sit there, virtual arms outstretched, set-pieces are thrown at you with the intent of making you release the keys. A swarm of bees surrounds you; a velociraptor pads into the room and breathes down your neck; knives fall from the ceiling and slam into the desk inches from your hands; the lights dim and a spider crawls up your arm. Even with the low-quality models, each event does a good job of making you feel exposed and uncomfortable. The demo is DK2 compatible, and when you lean back in your chair, or forward across the desk, your virtual body does the same. This was one of the best early Rift demos, and I can't wait for the DK2 version. It sees you locked inside an astronaut's suit, drifting slowly away from a space station orbiting Earth. Gentle piano music plays as you breathe rhythmically and the planet gets smaller and smaller. Asteroids drift past your visor and an on-screen meter tells you that you're steadily running out of oxygen. It's beautifully atmospheric, but also strangely claustrophobic. When you move your head, there's a slight delay, giving you the sensation of wearing a heavy helmet. While this astronaut seems to be committing some kind of space-suicide, the music gives it a dreamy, peaceful feeling. You can import your own music if you want to. The developers recommend Gary Jules's cover of Mad World by Tears For Fears. I suggest anything by Brian Eno, or Bowie's Space Oddity. Passive, hands-off experiences like this are some of the best available for the Rift. It's like a cyberpunk zen garden; a way to tune out of the world and clear your mind. I can see VR tech being widely used in the future as a form of relaxation, a screensaver for a busy brain. Rift demos where you're guided through a set-piece while sitting motionless are always more convincing than ones where you're in control with a gamepad or mouse and keyboard. It's not perfect, but Skyrim now has DK2 support. VorpX is a third-party tool that allows you to 'hack' stereoscopic VR into games that don't natively support it. Their long list of working games includes Fallout 3, Mirror's Edge, Dishonored andBioShock. It doesn't feel as smooth or polished as games built with the Rift in mind, but it still works. Being able to look around the snowy homeland of the nords makes it feel really, really big. The Throat of the World mountain, the biggest in the game, looks colossal and imposing when you stare up at it. Sitting in taverns, the flickering firelight gives you a real sensation of being there. It's not actually that much fun to play; the wobbly camera when you fight someone made me feel a bit queasy. But it's worth trying just to explore the environment with your jaw hanging open.